Aim: To compare pH changes at the cervical, middle and apical surfaces of root dentin in retreated and non- retreated teeth, after canal obturation with two different calcium hydroxide pastes. Materials and Methods: After instrumentation of 55 extracted teeth, three cavities with 0.75 mm depth and 1.5 mm in diameter were drilled at buccal root surface. The teeth were randomly divided into five groups. Canals in the first two groups were filled with either mixture of calcium hydroxide and saline solution and calcium hydroxide and 2% chlorhexidine (CHX). In the third and fourth groups canals were first obturated with gutta-percha and AH26 sealer, and then materials were removed. After 2 days canals were filled with two different calcium hydroxide pastes similar to the first and the second groups. The pH was measured in the prepared cavities at 1, 3, 7 and 14 days. Results: In the non-retreated groups, pH at the surface of the roots was significantly higher in comparison to the retreated ones (P value < 0.001). pH values were significantly higher in the non-retreated teeth filling with calcium hydroxide and saline solution (P value < 0.001). Conclusion: Regarding to the little pH changes at the surface of dentin in retreated teeth, the hydroxyl ions cannot penetrate into the dentinal tubules. Thus, to achieve higher pH at the root surface in retreated teeth, it is clinically advisable to remove more dentin from the inner walls and to use normal saline as a vehicle for calcium hydroxide rather than acidic pH materials. Cleansing and shaping of the root canal system are among the important phases in endodontic therapy. Nevertheless, it is recognized that chemo - mechanical instrumentation alone is unable to completely disinfect root canal systems. Furthermore, remaining bacteria in the root canal after instrumentation has been shown to proliferate between appointments. Hence, an antibacterial agent, such as calcium hydroxide, could be used as an intra-canal medicament. Calcium hydroxide has been widely used as an intra-canal medicament for retreatment of failed cases. , The purposes of intra-canal medication in retreatment cases are to eliminate bacteria, prevent their proliferation, act as a barrier against their ingress and cut off their nutrient supply. During the retreatment procedure, the openings of dentinal tubules may be obstructed with remaining sealer and gutta-percha. This phenomenon may impact on the diffusion and penetration of hydroxyl ions through dentinal tubules. Since, the diffusion dynamic of hydroxyl ions through dentin and its consequent pH changes at the root surfaces of retreated teeth have not been studied; the purpose of this study was to investigate the in vitro pH changes at the root surfaces of retreated and non-retreated teeth following the placement of two different calcium hydroxide root canal dressings. Fifty-five extracted human permanent teeth with single canal were selected and stored in sodium azide (NaN3) solution. Teeth with cracks, restorations, and open apices were excluded. Adherent soft tissue was mechanically removed with care not to damage the root surface. Before the beginning of the experiment, all teeth were washed under tap water and stored individually in sterile saline. A coronal access cavity preparation was made in a conventional manner and the root canal working length was determined at 1 mm short of the major apical foramen. Root canal preparation was performed by standard step back technique using K-files (Dentsply, Maillefer, Ballaigues, Switzerland) to # 35 master apical file. A standard flare was produced by the insertion of # 3 to # 5 Gates-glidden drills (Dentsply, Maillefer). Irrigation during cleansing and shaping was accomplished using 2.5% sodium hypochlorite (Paksan, Tehran, Iran). After the completion of the instrumentation, the root canals were irrigated with 10 ml of 17% EDTA (Merk, Germany) followed by 10 ml of 2.5% NaOCl to remove the smear layer and finally rinsed with copious amounts of distilled water. Three wells were drilled on the center of cervical, middle, and apical third at the buccal root surfaces of all teeth, using a # 008 high-speed bur. The cavities were 0.75 mm deep and 1.5 mm in diameter. The prepared wells were then cleansed with 1 ml of 17% EDTA for 5 min, followed by a 5 ml flush of 2.5% hypochlorite to remove the smear layer, then rinsed with distilled water. The teeth were randomly divided into 5 groups, each containing 11 teeth. Group A: The root canals were obturated with creamy mixture of calcium hydroxide (Golchai, Tehran, Iran) and saline solution. Group B: The root canals were obturated with creamy mixture of calcium hydroxide and 2% CHX (Merk, Germany). Group C and D: The root canals were obturated with gutta-percha and AH26 sealer (Dentsply, Maillefer), using standard lateral condensation technique. The specimens were stored in containers with an unbuffered isotonic saline saturated cotton wool for 72 h, allowing the sealer to set. Afterward, gutta percha was removed from the canals, using chloroform and file. Teeth in group C and D were obturated with creamy mixture of calcium hydroxide and saline or CHX, as the manner of group A and B respectively. Group E served as the negative control group and the canals were left empty after preparation. The coronal access cavities were sealed with Celtosol (Golchai, Tehran, Iran) and then were placed into individual vials containing cotton saturated with unbuffered isotonic saline, to ensure 100% humidity. After 24 h, the pH was measured to determine the baseline pH. For measuring the pH, every tooth was rinsed in saline solution until the wells were filled with this solution. After 5 min a Tornesol paper (Merk, Germany) was immersed into the solution in the prepared cavities. Discoloration of the Tornesol paper in comparison with a pH determination guide (with accuracy of 0.5 per pH unit) was recorded. These procedures were conducted at 3, 7 and 14 days. At every interval time, each tooth was removed from its vial and rinsed with saline to ensure that each well was filled with solution. At the end of each stage, the teeth were returned to its vial with newly placed cotton saturated with saline. As pH values are logarithmic, nonparametric statistics were applied to compare pH values at the root surface between groups: Kruskal - Wallis one way analysis of variance followed by Mann - Whitney U test for individual comparisons. The resulting pH values from each group at cervical, middle and apical levels were compared using one-way analysis of variance (ANOVA) followed by an unpaired t- test. The results indicated that pH values at the surface of the roots in the non-retreated groups were significantly higher in comparison to the retreated groups (P value < 0.001). Comparison of the pH values among all groups showed that, non-retreated teeth obturated with calcium hydroxide and saline solution have significantly higher pH average at all time periods (P value < 0.001). In the non - retreated groups, calcium hydroxide paste with saline (Group A) produced the highest mean pH at day 3 in the apical region (pH 9.9). At day 3, the highest pH value between groups was observed at the apical third (pH 10.5) [Table 1]. Calcium hydroxide paste with 2% CHX (group B) showed the highest mean pH value at day 3 in the apical region (pH 8.7) [Table 2]. 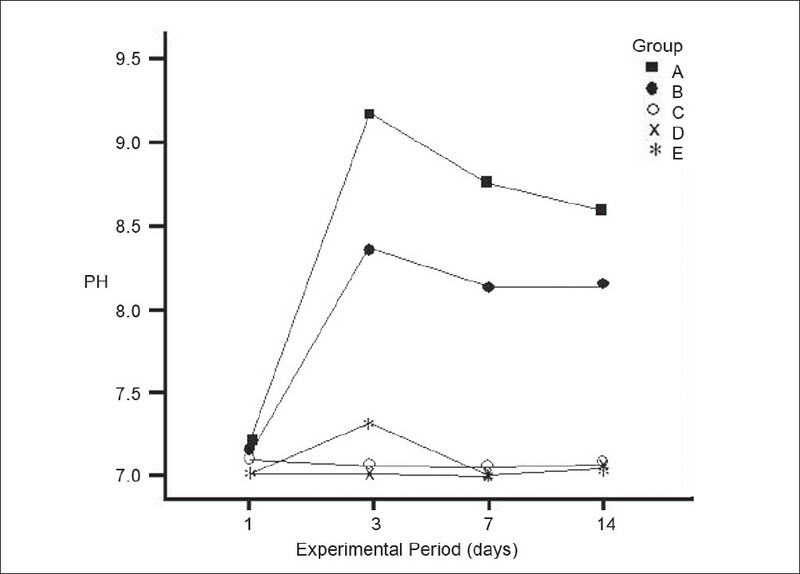 The pattern of pH changes in the retreated and control group at the three surface levels was nearly identical throughout the duration of the experiment. The average baseline pH in retreated and negative control group was similar (pH 6.9-7.2). The average pH in every tooth was significantly different at each surface level (P value < 0.001). The highest measurement was recorded for the apical region. [Figure 1], [Figure 2] and [Figure 3] show the mean pH values in the cervical, middle and apical third for the 5 groups. The average pH in the non-retreated teeth was significantly higher at all surface levels (P value < 0.001). This in vitro study compared the pH changes over time, in the cervical, middle and apical area on the surface of extracted teeth, following retreatment and after application of two different calcium hydroxide pastes. The results of this study demonstrated that after calcium hydroxide pastes were placed into the root canals, pH in cavities prepared on the surfaces of the non- retreated teeth, increased as opposed to the retreated samples. This may be partly due to the obstruction of dentinal tubules by the remaining gutta-percha and sealer. It is supposed that in the retreatment cases removing more layers from the inner dentinal walls to expose more patent tubules may be helpful to attain the aforementioned properties of calcium hydroxide pastes. The difference in diffusion of hydroxyl ions through dentin at different root surface levels may be dependent on various factors. Nerwich et al. demonstrated that when calcium hydroxide pastes were placed into the root canals of extracted teeth, the hydroxyl ions diffused more quickly through dentin in the cervical third of the root than in the apical third. A study by Esberad et al. revealed similar results, although these differences were not significant. These findings could be explained by the presence of more tubules with a large diameter in the cervical third. By contrast, Chamberlain et al. and Kwon et al. demonstrated that pH values were higher at the apical area in comparison to coronal third. In the present study we have attained similar findings. Because of less thickness of dentin in the apical area, if dentinal tubules are patent, the hydroxyl ions could penetrate into the dentin and reach to the root surface area faster, in comparison with the coronal part. 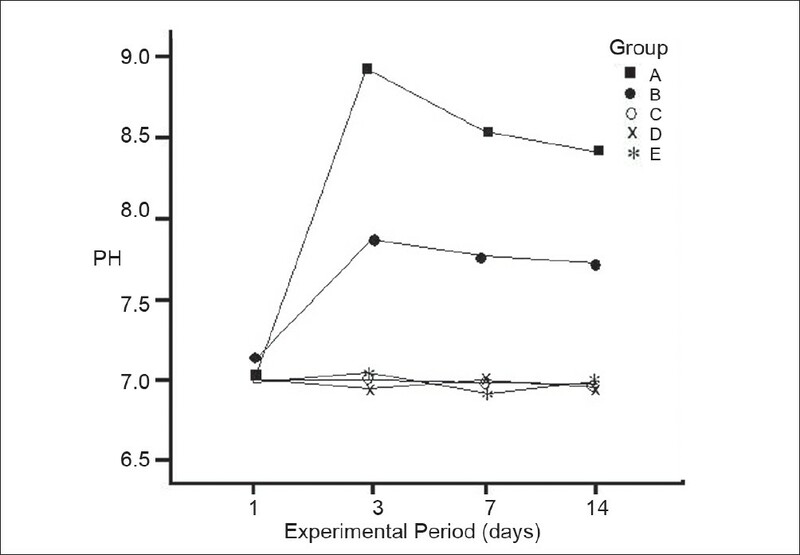 In this study, pattern of pH change in the non-retreated and control group at all three regions was nearly identical throughout the duration of the experiment. Esberard et al. showed similar results. 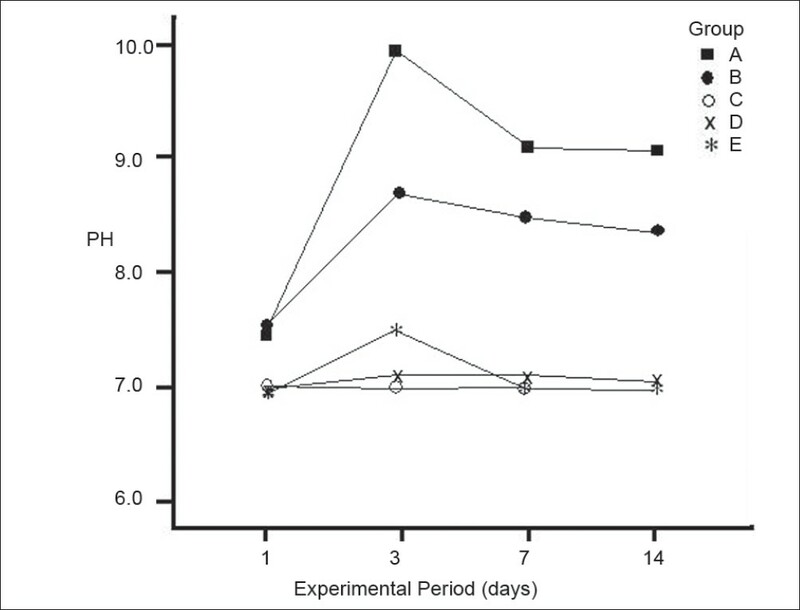 The pH in cavities on the root surface rapidly increased from control values (pH 7.8) to greater than pH 9.0 within three days, followed by a small decline to pH 9.0 over the next 18 days. In our study, pH in the non-retreated teeth increased up to day 3, at different areas on the root surfaces. Afterward, the pH values declined up to day 14. CHX has a reasonably wide range of antimicrobial activity and it is more effective at alkaline than acidic pH  . Shafer et al. reported that 2% CHX gluconate was significantly more effective against E.faecalis than a calcium hydroxide paste used alone, or a mixture of the two. In a study by agar diffusion, Haenni et al. could not demonstrate any additive antibacterial effect by mixing calcium hydroxide powder with 0.5% CHX. They showed that at a pH greater than 10, due to the deprotonation of CHX, the solubility and interaction of CHX with bacterial surfaces might be hampered. Although calcium hydroxide did not lose its antibacterial properties in such a mixture; chemical interaction with cationic CHX molecules, with an acidic pH (approximately 6.3), may decline the concentration of the hydroxyl ions and subsequently the pH value. In this study we observed that pH values at the root surfaces were significantly higher in calcium hydroxide and saline group in comparison with calcium hydroxide and CHX group. Therefore it is recommended that in cases when increasing pH at the root surfaces is critical for clinician (i.e. avulsion and external root resorption), it is better not to use an acidic carrier such as CHX. The authors wish to give special thanks to Reihane Mohammadi and Ezat Labafi for their contributions to the manuscript. 1. Johnson WT, Noblett WC. Cleaning and Shaping. In: Torabinejad M, Walton ER, editors. Endodotics Principles and practice. 4th ed. St. Louis: Mosby; 2009. p. 258-60. 2. Spangberg LS, Haapasalo M. Rationale and efficacy of root canal medicaments and root filling materials with the emphasis on treatment outcome. Endod Top 2002;2:35-58. 3. Tang G, Samaranayake LP, Yip HK. Molecular evaluation of residual endodontic micro-organisms after instrumentation, irrigation and medication with either calcium hydroxide or Septomixine. Oral Dis 2004;10:389-97. 4. Dammaschke T. The history of direct pulp capping. J Hist Dent. 2008;56:9-23. 5. Mohammadi Z, Dummer PM. Properties and applications of calcium hydroxide in Endodontics and dental traumatology. Int Endod J 2011;44:697-730. 6. Silveira CF, Cunha RS, Fontana CE, de Martin AS, Gomes BP, Motta RH, et al. Assessment of the antibacterial activity of calcium hydroxide combined with chlorhexidine paste and other intra-canal medications against bacterial pathogens. Eur J Dent 2011;5:1-7. 7. Silveira LF, Silveira CF, Martos J, Piovesan EM, César Neto JB. Clinical technique for invasive cervical root resorption. J Conserv Dent 2011;14:440-4. 8. Canoglu E, Turgut MD, Tekcicek M. Healing of external inflammatory root resorptions and periapical lesions without surgical treatment in an operated oblique facial cleft case. Eur J Dent 2010;4:208-14. 9. Esberard RM, Carnes DL Jr, del Rio CE. Changes to pH at the dentin surfaces in roots obturated with calcium hydroxide pastes. J Endod 1996;22:402-5. 10. Cwikla SJ, Belanger M, Giguere S, Progulske-Fox A, Vertucci FJ. Dentinal tubule disinfection using three calcium hydroxide formulations. J Endod 2005;31:50-2. 11. Gomes BP, Ferraz CC, Vianna ME, Rosalen PL, Zaia AA, Teixeira FB, et al. In vitro anti- microbial activity of calcium hydroxide pastes and their vehicles against selected micro-organisms. Braz Dent J 2002;13:155-61. 12. Schafer E, Bussmann K. Anti-microbial efficacy of chlorhexidine and two Calcium Hydroxide formulations against Enterococcus faecalis. J Endod 2005;31:53-6. 13. Haenni S, Schmidlin PR, Mueller B, Sener B, Zehnder M. Chemical and antimicrobial properties of calcium hydroxide mixed with irrigating solutions. Int Endod J 2003;36:100-5. 14. Sjögren U, Figdor D, Persson S, Sundqvist G. Influence of infection at the time of root filling on the outcome of endodontic treatment of teeth with apical periodontitis. Int Endod J 1997;30:297-306. 15. Saber Sel-D, El-Hady SA. Development of an intra-canal mature Enterococcus faecalis biofilm and its susceptibility to some antimicrobial intra-canal medications: An in vitro study. Eur J Dent 2012;6:43-50. 16. Robert GH, Liewehr FR, Buxton TB, Mc Pherson JC 3rd. Apical diffusion of calcium hydroxide in an in vitro model. J Endod 2005;31:57-60. 17. Siqueira JF Jr, Lopes HP. Mechanisms of antimicrobial activity of calcium hydroxide: A critical review. Int Endod J 1999;32:361-9. 18. Athanassiadis B, Abbott PV, Walsh LJ. The use of calcium hydroxide, antibiotics and biocides as antimicrobial medicaments in Endodontics. Aust Dent J 2007;52(1 Suppl):S64-82. 19. De Souza CA, Teles RP, Souto R, Chaves MA, Colombo AP. Endodontic therapy associated with calcium hydroxide as an intra-canal dressing: Microbiologic evaluation by the checker- board DNA-DNA hybridization technique. J Endod 2005;31:79-83. 20. Sundqvist G, Figdor D, Persson S, Sjögren U. Microbiologic analysis of teeth with failed endodontic treatment and the out- come of conservative re-treatment. Oral Surg Oral Med Oral Pathol Oral Radiol Endod 1998;85:86-93. 21. Chong BS. MTA or calcium hydroxide treatment for immature permanent teeth Evid Based Dent 2012;13:11-7. 22. Nerwich A, Figdor D, Messer H. pH changes in root dentin over a 4-week period following root canal dressing with calcium hydroxide. J Endod 1993;19:302-6. 23. Chamberlain TM, Kirkpatrick TC, Rutledge RE. pH changes in external root surface cavities after calcium hydroxide is placed at 1, 3 and 5 mm short of the radiographic apex. Dent Traumatol 2009;25:470-4. 24. Kwon TY, Fujishima T, Imai Y. FT- Raman spectroscopy of calcium hydroxide medicament in root canals. Int Endod J 2004;37:489-93.